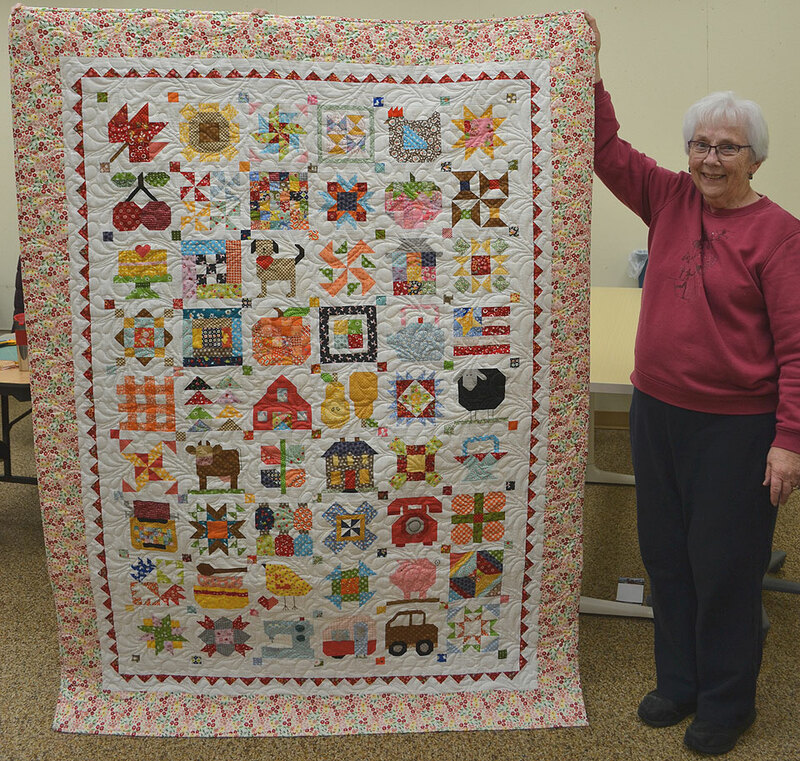 At the last Quilts of Valour meeting here at the store, Sandy C. brought in her Farm Girl Vintage quilt to show. 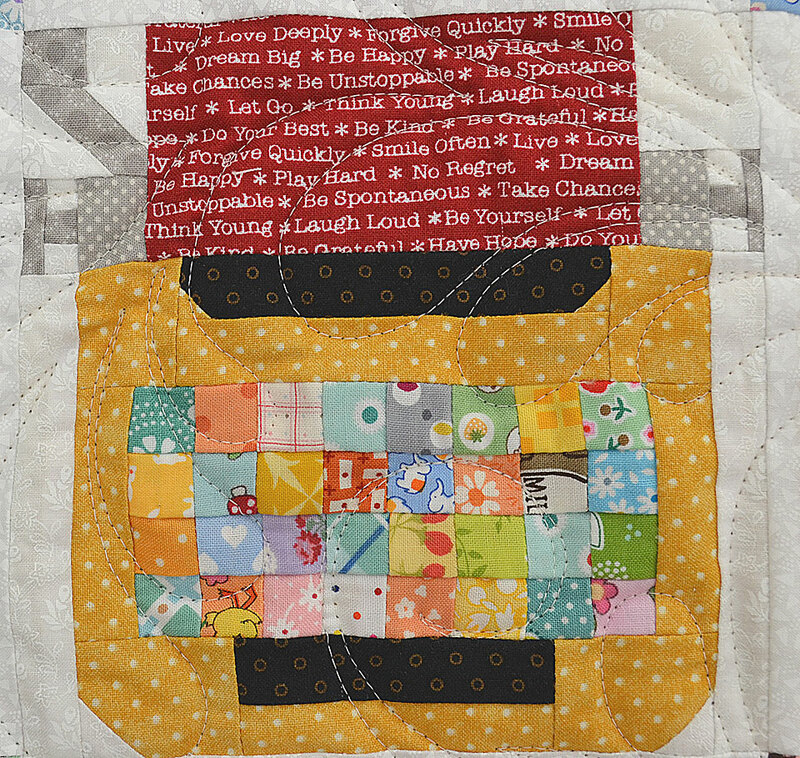 Each block is 6″ square, and she sashed it with the background of white, and added colour cornerstones. Click for larger, crisper image. Sandy started off with one of the fabric rolls we sell that give you a great selection of small, bright mini prints. Each roll has 25 different fat eighth fabric pieces measuring approximately 10″ x 21″ in a range of colours from yellow, orange, red, pinks, green, brown, teals, and blues. The price per roll is $62.99. The white background can be scrappy as well, and a 13-piece fat eighth bundle of tone-on-tone whites will get you well on your way to constructing over 40 6″ blocks. This bundle is $32.99. Once outfitted with the book and some bundles, Sandy was off to the sewing machine. Besides using the Farm Girl Vintage book by Lori Holt, she found some more fun blocks in the “Spelling Bee”. While most of the blocks in the “Spelling Bee” are the alphabet, numerals, and punctuation, there are also other blocks such as the sewing machine, dog, typewriter, and camera. 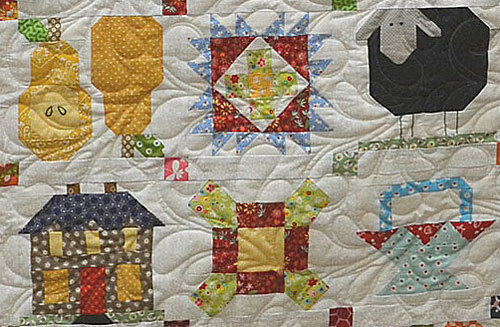 Both books are chock-a-block filled with multiple quilt designs and variations. Coming in at over 140 (Farm Girl Vintage) and 190 (Spelling Bee) pages, Lori provides multiple block sizes and full diagrams for piecing each block. Thankfully, both books are spiral-bound! Sandy loved making the blocks, and so far, has made 3 quilts. 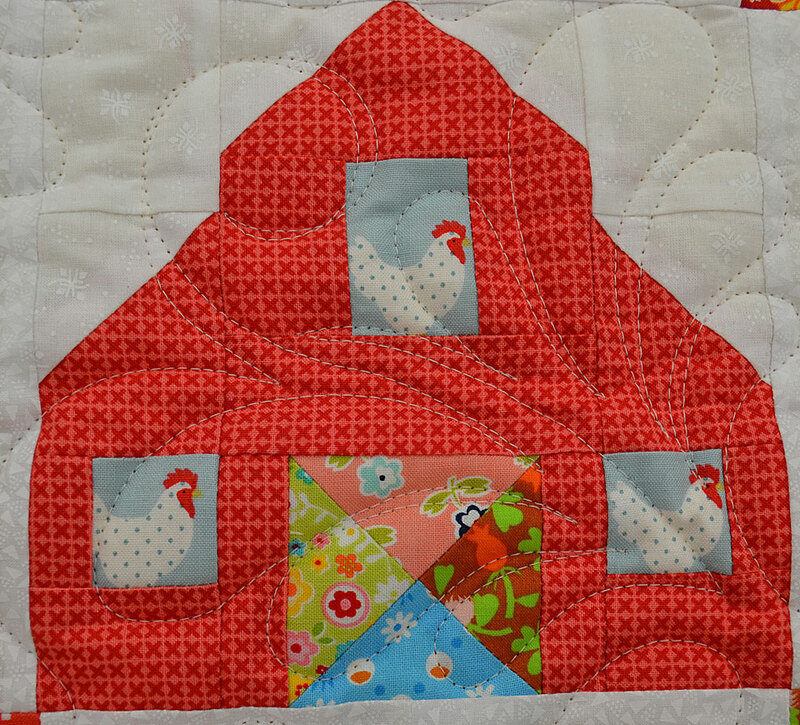 Some customers make fewer blocks and do up lovely baby quilts. In our store, we have a full-size hanging top, as well as a small baby or wall hanging size. Sandy got creative with her choice of fabrics for each block. Check out who is living in Sandy’s barn, and the words of wisdom on the typewriter. We can see she had a lot of fun! And she didn’t stop there, she quilted (yes, she does her own quilting) with a very swirly all over design that looked great. On a side note, if anyone wants to join Sandy at the Quilts of Valour charity group here at the store, they meet at 10:30 am to 4 pm on the 1st Tuesday of the month. More information can be found here.